FVTC President Dr. Susan May and members of the Sommer family. This week in a special signing ceremony, the College will be entering into a memorandum of understanding with one of our very special business partners—Service Motor Company (SMC). SMC runs agriculture and industrial equipment dealerships here in northeast Wisconsin and covers a substantial geographic footprint with sales, service and support of Case IH equipment and several other brands. This is a family owned and operated business, one that has been in the Sommer family for generations. 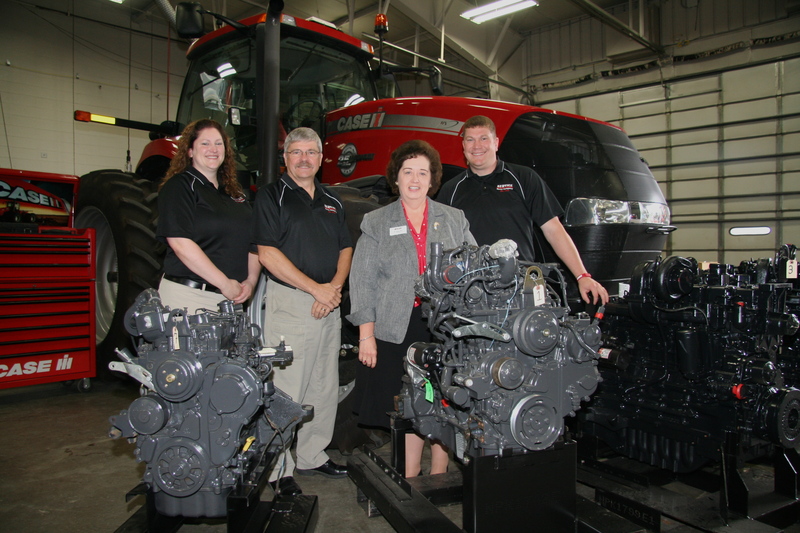 The Sommers and SMC have worked closely with our Agriculture Department faculty and staff for many years as program and curriculum advisors, providing us with access to their staff expertise, and serving as a pivotal partner in the incredible equipment consignment arrangement we have with Case IH. They hire our graduates and send many of their employees to us for specialized training. They have been relentless, positive voices from the agriculture industry about the importance of this sector remaining strong and progressive. Dr. May and SMC President Jim Sommer. The special signing ceremony this week just builds on a long and wonderful working relationship between SMC and FVTC. Through the visionary leadership of SMC President, Jim Sommer, his son Kevin, and daughter Kim, they have committed $1.1 million in equipment, cash, and scholarships over several years in support of our agriculture programming. In recognition of their long history of support and this incredible donation, we will soon be naming our Agriculture Center the “Service Motor Company Agriculture Center” at Fox Valley Technical College. Service Motor Company is a great example of an employer in one of our key industry sectors getting very engaged with the educational programs that will be critical to their future success. Unlike too many other employers who worry about having a skilled future workforce, expect others to solve that problem, and wring their hands, SMC not only has provided visionary leadership and guidance to the College, but is assisting with resources that will make a huge difference as we work together to attract more young people to the outstanding career opportunities in agriculture. They are true partners with us. My hat’s off to Jim and Kevin Sommer, and the entire SMC organization for both their generosity and for being proactive industry leaders. We are most grateful.